The Cottages at The Village of Carolina Place is a neighborhood of 55+ single-family homes in Pineville, North Carolina. The Cottages are 96 homes inside of the gated community known as The Village of Carolina Place. This active adult community enjoys the peace of small town living near the heart of Charlotte s premiere shopping, dining, and recreational districts. Homeowners in The Cottages at The Village of Carolina Place enjoy the privacy of owning their own single-family home with exterior maintenance handled by the homeowners association. Residents have more time to enjoy the nicely designed amenities that are found within the community. The Cottages residents have their very own clubhouse. Here, residents can enjoy the outdoor pool, rent a book from the small library, exercise in the fitness room, or play a game in the multi-purpose room. The clubhouse even has a catering kitchen, perfect for parties and events. The Cottages at The Village of Carolina Place embraces nature with gardening plots, a putting green, and walking/biking trail. Concorde Construction developed The Cottages at The Village of Carolina Place in 2004 and by 2009 it was completed with 96 cottage-style homes. There were ten floor plans offered, all but one were single-level. However, the only two-story floor plan offers a first-floor master suite. These low-maintenance homes range from 1,389 to 2,453 square feet in size with two to three bedrooms, two to two-and-a-half bathrooms, and a two-car garage. All homes feature front porches, rear-load garages and available basements. Residents of The Cottages often meet at the clubhouse for activities and events. Popular social activities include bingo, bridge, book club, game night, and more. 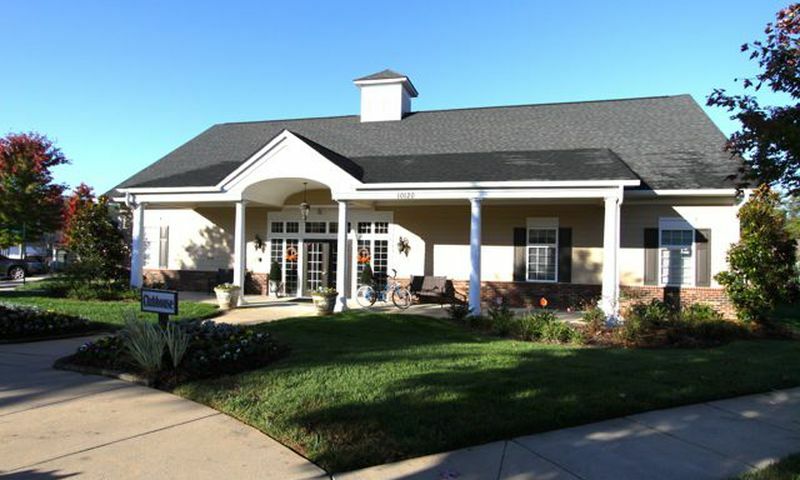 The Cottages at The Village of Carolina Place promotes a fit and active lifestyle by hosting dance and exercise classes. Because this community welcomes active adults aged 55 and better, it's easy to get to know your new neighbors and make lifelong friends. The Cottages at The Village of Carolina Place is situated near Charlotte in Pineville, North Carolina. Pineville combines the charm of a quaint community complimented by the amenities of a large city. From antique shops in the historic downtown, to the thriving retail center anchored by Carolina Place Mall, you will find the best of both worlds. Just 13 miles south of Charlotte, residents enjoy quick and easy access to a variety of shopping, restaurants and culture. There are plenty of activities available in The Cottages at The Village of Carolina Place. Here is a sample of some of the clubs, activities and classes offered here. The Cottages' single-family homes are available on resale only basis. . There were ten floor plans offered that range from 1,389 to 2,453 square feet in size. These low-maintenance residences offer two to three bedrooms, two to two-and-a-half bathrooms, and a two-car garage. All homes feature front porches, rear-load garages and available basements. 55places.com is not affiliated with the developer(s) or homeowners association of The Cottages at The Village of Carolina Place. The information you submit is distributed to a 55places.com Partner Agent, who is a licensed real estate agent. The information regarding The Cottages at The Village of Carolina Place has not been verified or approved by the developer or homeowners association. Please verify all information prior to purchasing. 55places.com is not responsible for any errors regarding the information displayed on this website.